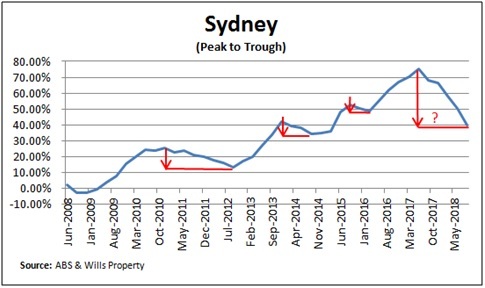 Based on CoreLogic data Sydney dwelling prices fell 25% in 1980-83, 10% in 1989-91, 8% in 2004-06 and 7% in 2008-09. Therefore a 25% decline since the peak in June 2018 would be similar to that in the early 1980s. I wanted to dig a bit deeper to understand how long such ‘falls’ last, therefore I investigated the Sydney market movement during the 2000’s on a rolling five year basis, analysing timing as it relates to “peak to trough” movements. Over this period the Sydney market took an average of 13.50 months in which to fall, the quickest being 6 months and the longest 21 months. The latest peak of the market was June 2017. We can immediately ignore the average as this would have seen the market bottom out in July 2018. Application of the longest decline of 21 months indicates that the bottom of the trough could be in February 2019. With market ‘momentum’ still fixated on decline even February looks at risk and, considering the potential impact of the Federal election, it appears that the bottom of the trough may not be reached until mid 2019. 1) Recent changes in APRA regulation which will see an easing in banking regulatory requirements for investor loans. 2) Discussion & possible movement around interest rate cuts. 4) Banks being repatriated with funds from loans from competing development stock which will then need to be re-deployed to maintain profitability. A rebound in pricing will happen. 2019 could offer significant opportunities for the astute residential investor. If you or your friends wish to discuss circumstances regarding any property issue please feel free to call me on +61 467443838. I am here to help.